Here you will find some of the most popular questions. The answers are the facts and if you need further explanation you can always contact me. HECM is the acronym for a Home Equity Conversion Mortgage, which is a reverse mortgage created by and regulated by the U.S. Government Department of Housing and Urban Development. (HUD) However it is not a government loan. It is a loan that is repaid in the future when the last borrower dies or permanently leaves their residence. The HECM loan is issued by a private bank, and insured by the (FHA) Federal Housing Administration, which is a department of HUD. Each year the borrower is charged an annualized insurance fee of 1.25% of the loan balance. Your loan balance over time will increase by the amount of this fee. (the lenders rate is also accruing) If the borrower has a HECM line of credit , the unused portion grows larger for future use by a growth rate which is the same 1.25% plus the lenders initial rate. The insurance purchased by this fee protects the borrower (1) if and when the lender is not able to make a payment; and (2) if the value of the home upon selling is not enough to cover the loan balance. In the latter case, the government insurance fund would pay off the remaining balance to the lender. Currently, HECMs make up 99% of the reverse mortgages offered in America. HECMs come with rules and regulations that include the requirement that the borrower receive third-party HUD counseling. How do I qualify for a reverse mortgage? To become eligible for a reverse mortgage, you must be at least 62 years old. A reverse mortgage is permissible only on your primary or principle residence in order to access a portion of the equity in your home.There are no special medical requirements and borrowers always maintain title and ownership of their home. For a refinance you must have enough equity in the home to pay off any outstanding balances if any. Beginning April 2015, income and credit requirements are in place to satisfy Financial Assessment guidelines. These HUD requirements and lender guidelines are qualifying criteria so as to be certain the borrower has the ability pay their property taxes, home owners insurance and other applicable property changes. Compensating factors and extenuating circumstances are included in this assessment. How much money can I receive? The amount of money that a lender will loan depends upon: the age of the youngest borrower at the time of closing, the lending limit/maximum claim currently $636,150 or the value of your home whichever is less, the total amount of liens, the equity in your house, and the expected interest rates. The type of reverse mortgage product and the payment options can also affect the amount of money you will receive. How do I receive my money? When the loan is a refinance, there are several different options to choose from. You can set up a (LOC) line of credit, take the money in a lump sum distribution, or create a monthly term or tenure payment. Every borrower has unique needs which will equally determine if they choose a fixed or adjustable rate loan (ARM). What costs are associated with a reverse mortgage? The costs of a reverse mortgage loan are very similar to a “forward” conventional loan. Closing costs include an appraisal and customary title and escrow fees associated with settlement. If there is an origination fee, it is paid to the lender, the financed upfront mortgage insurance premium(MIP), is paid to HUD on the Home Equity Conversion Mortgage (HECM.) The HUD Counseling fee is paid directly to the interviewing agency. Do I get taxed on the money I receive from my reverse mortgage? No. The equity in your home is considered your money and not additional income. All the funds from a reverse mortgage are income tax free. (Borrowers should seek professional tax advice regarding reverse mortgage proceeds.) Although the proceeds from a reverse mortgage are not subject to personal income taxation, you should seek tax advice on how proceeds may effect government needs-based programs such as Medicaid and Medi-Cal. 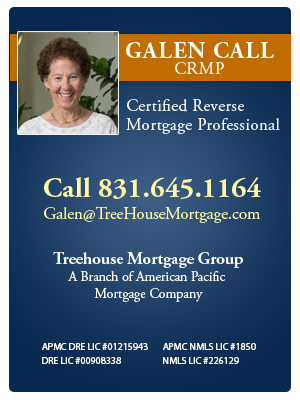 Is it true I can purchase a home with a reverse mortgage? Yes! A growing segment of the senior population is using the HECM to purchase a home that better suits their needs. To date a qualified senior has used the HECM to eliminate debts, pay for healthcare and/or cover daily living expenses. Using the HECM to improve a financial plan as well as purchase a new primary residence is a growing trend. The advantage of using HECM for Purchase is that the new home is purchased outright, using funds from the sale of the old home, private savings, gift money and other sources of income, which are then combined with the reverse mortgage proceeds. This home buying process leaves you with no monthly mortgage payments. This option has many beneficial reasons including downsizing, moving closer to family or friends finding a home that’s more easily navigable or securing lower overall maintenance costs. Did I say no monthly mortgage payments? !